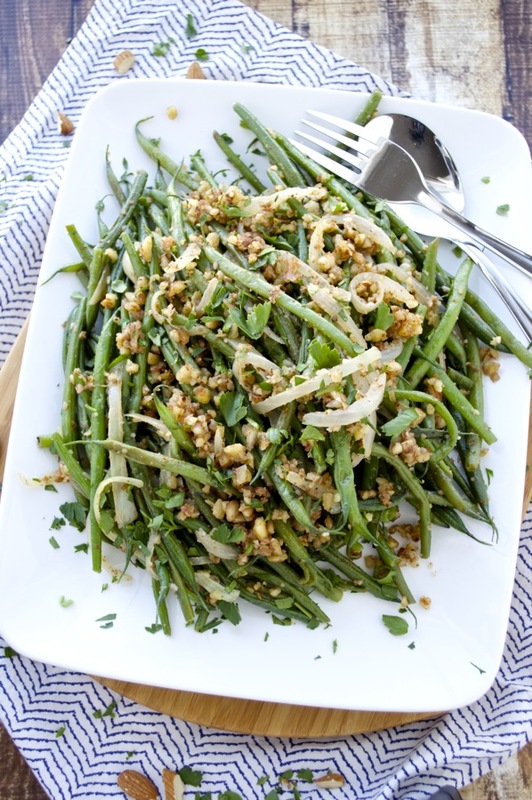 Crisp-tender green beans are sautéed with onions and almonds in this healthy side dish. This dish makes a great accompaniment to any meal! A few weeks ago while shopping at whole foods, I spotted a steam-able bag of fresh haricot vert (french cut green beans). I grabbed them without having anything in mind, but I knew I would come up with something. We also picked up some fresh sausages at the meat counter while we were there. Kyle planned on having his with peppers on a hoagie roll, while I planned on eating mine with extra peppers and no roll. While the sausages were cooking I remembered I had those green beans and quickly threw them in the microwave to steam. It only takes about 5 minutes and you have perfect green beans right in the bag! Anyway, I wanted something more than just plain green beans, so I sautéed them with some onions, almonds, and fresh thyme. They turned out so good that I decided to make them again to share with you. Even my nut-hater of a fiancé enjoyed these! This side dish is healthy, comes together super fast, and couldn’t be easier! Especially if you can get those steam-in-a-bag fresh green beans. 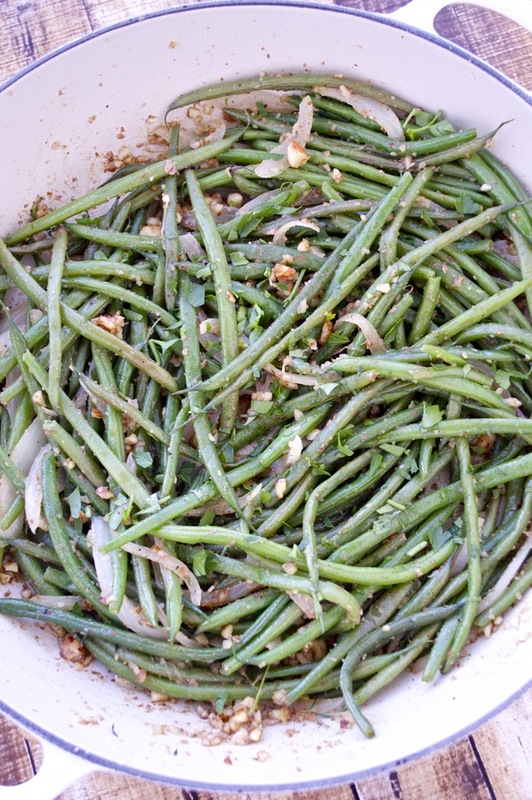 I really prefer the thin haricot vert, but regular green beans will work just as well. I sautéed everything in coconut oil, which is delicious and gives you a very similar taste/texture as butter. You don’t really pick out the coconut flavor, it really does act like butter. I’m sure you all know the magic of coconut oil, so I won’t bore you with anymore! I’ve served these green beans with my meatballs and lemon dill salmon. You can really serve these with anything! They definitely paired well with my tuscan chicken sausage that I love from whole foods. Have you ever tried any of the fresh sausages? They have so many flavors, which are all awesome and fresh made in store. Next time you’re in whole foods give them a try! 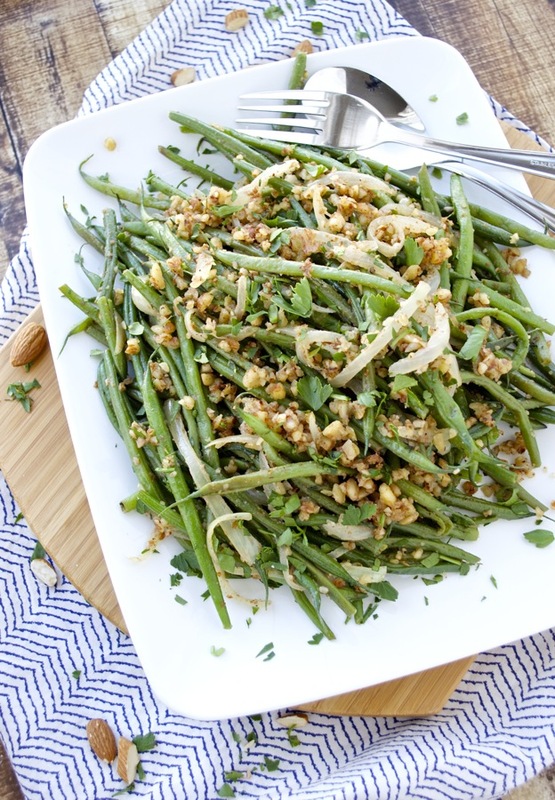 Crisp-tender green beans are sautéed with onions and almonds in this healthy side dish. This dish makes a great accompaniment to any meal! Steam the fresh green beans in the microwave according to package instructions. Alternatively you can steam the beans on the stovetop for about 8 minutes or until crisp tender. Heat the coconut oil over medium-high heat in a large sauté pan. Add in the onion and fresh thyme and cook for 2-3 minutes or until soft. Add in the almonds and season the mixture with salt and pepper. Toss in the green beans and mix well. Cook for about 1 minute to let the flavors combine. Top the beans with fresh parsley and serve. 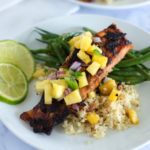 What a fresh and flavorful, dish! I love the addition of almonds, gives it such a nice, crunchy flavor! Looks delicious! Thanks, Gayle! I love almonds and they go so great in the recipe! Keri, this is a beautiful side dish and so full of flavor. It’s been a while since I’ve made beans but I think it’s time I change that. Looks delicious. 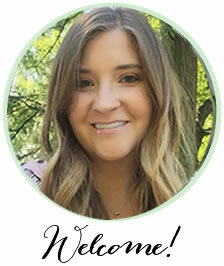 Hi Keri, I found you thur a fellow blogger’s page! Stopped to say hi! Even though beans are a good side, I can eat just bowl of these for lunch too! Love the presentation! pinned! 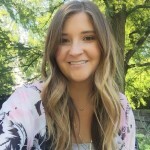 Cailee recently posted…National Nutrition Month! These look great Keri – I can’t do canned green beans and really prefer the fresh ones, but have never seen a steamable bag. I’ll have to keep an eye out for them! Thanks, Jessica! I can’t do canned either! The steam-able bags are awesome – it’s the most convenient way to eat fresh green beans. They are already cleaned and trimmed! These are my kind of veggies! I love it when they are covered with other goodies that I don’t even notice the green stuff. Now you have me craving meatballs too. I guess I know what’s for dinner tonight! 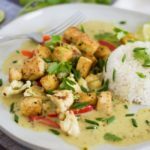 Hi Keri, great recipe, I’m glad that I found it. Weeks ago I tried something similar but it turned out to be too dry. I will try your recipe. Thanks for sharing. Thanks, Jess! 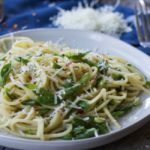 It’s my new favorite ways to eat green beans – I’ve had them 3 times in the past 2 weeks! Me too, Natalie! I’m obsessed with these steam in a bag haricot vert. I just can’t get enough of this side – I’ve been eating so much lately! I love green beans! I have never made them will coconut oil and am so excited to try your version Keri!! 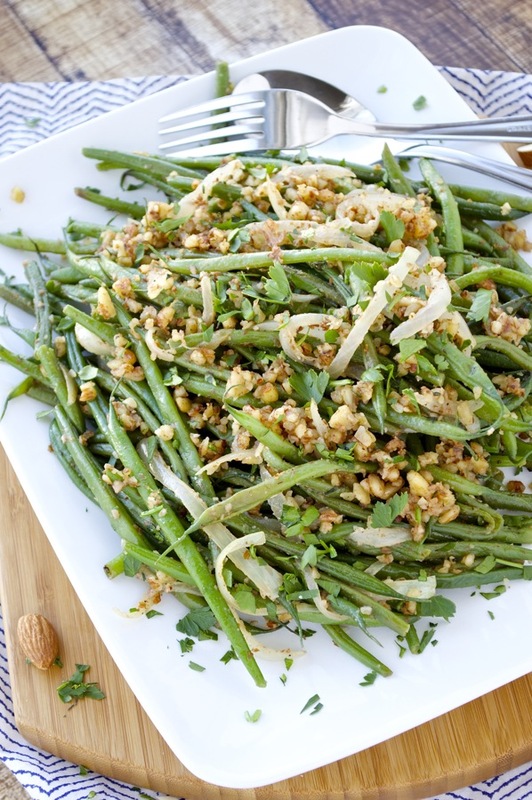 Almonds are just such a perfect compliment to green beans and these look so tasty!